But DePenning was worried. He knew how to handle fire. He didn’t know what to do with computers or GIS. He participated in a two-week in-house training course in ArcInfo 2.6. “I’ve always prided myself on being able to adapt and figure things out,” he says. “Yet I have to admit it was the most intimidated I’ve been in my entire life.” But the promise of what he could achieve convinced him to keep at it. 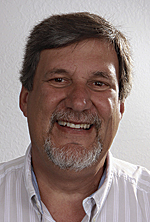 “What I heard and saw really got me excited about the future of GIS. I knew there was something there and we were pioneering a new technology,” DePenning adds. Born in Oskaloosa, Iowa, DePenning attended college but never graduated. “When I left college, I figured I’d just stay in Iowa the rest of my life—working in a construction trade. It didn’t occur to me that I would do anything else,” says DePenning. But he had recently married, and his wife missed her family in South Carolina. The couple decided to move. Combing the local classifieds, an ad caught his eye. “It said the Greenville Fire Department had an opening for a fire fighter.” He got the job and worked as a fire fighter for almost four years when he got the call from the fire chief to help the department use GIS. Greenville became the first city in the United States to successfully implement GIS in a municipal environment. An impressive goal given Greenville’s size. Back then, it had just over 50,000 people. 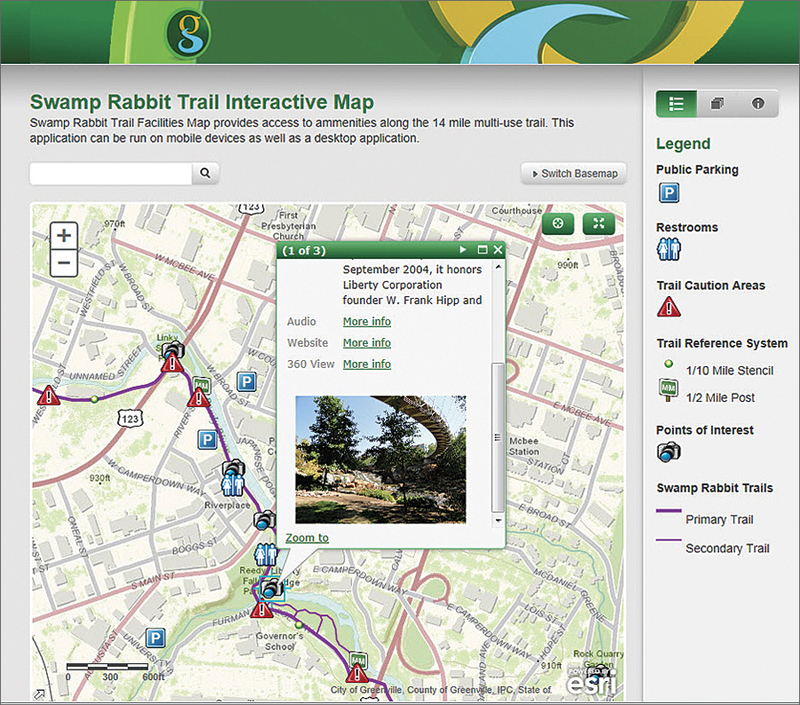 Greenville's Swamp Rabbit Trail Interactive Map shows a variety of amenities along the trail, including pictures and links to audio and 360-degree imagery. But DePenning worked through those challenges, ultimately coauthoring Greenville’s first end-user GIS application. The application was a hazardous materials evacuation model, which overlaid a plume on demographic data to show emergency managers which areas needed to be evacuated in a chemical spill. It was internationally recognized with an award from URISA. In 1989, DePenning transferred from the Fire Department to work full time in the GIS Department. “Right after making the move, my boss left,” he says. “The city began looking for someone to lead the development. They wanted someone with a lot of hands-on GIS experience.” None of the candidates were as qualified as DePenning. A year into the search, he was offered the position of GIS administrator. It was clear to DePenning that city operations had benefited from GIS. But he was determined to get Greenville residents more actively engaged with the technology. Recently, he saw an opportunity with a new trail the city opened called Swamp Rabbit. Safety was a growing concern because the trail runs 14 miles along the river and is isolated in some areas. He began to ask questions. How do first responders find people in trouble? How do those people communicate where they are? And what about daily issues like where are the closest restrooms? Where’s the best parking? Those questions led DePenning and his team to create an application they call the Swamp Rabbit Trail Interactive Map. DePenning and his team surveyed the entire trail using GPS and collected points of interest along the way. “ArcGIS Online provided the infrastructure to load the application on any device, so people can use it on their desktops before they leave or follow along on their cell phones once they’re on the trail—it’s taken off like crazy,” he says. The team is now working on a similar application for Greenville’s downtown events and attractions. For more information, contact Mark DePenning, GIS administrator, City of Greenville, South Carolina.